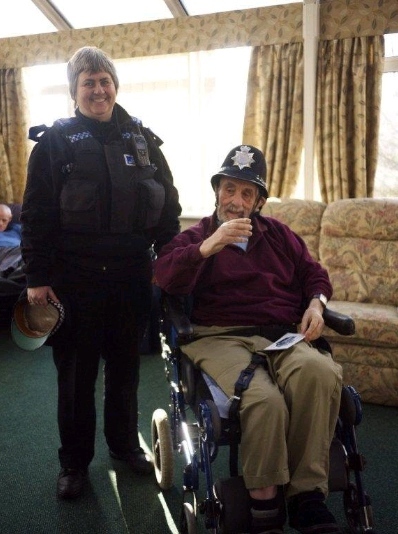 This is a picture of Mr Eric Bond on his 80th birthday being presented with a new police helmet by PCSO Ellen Holah on the 9th February 2012. Eric lives at Denis Taylor House in Exeter and has been a fan of the police service for many many years. I have known Eric since 1975 and am now very pleased to be his advocate. I wrote to the police at Heavitree police station and was delighted to receive a very prompt reply and PC Gary Wall arranged for Ellen to come on Eric’s birthday to present him with a genuine police helmet. After his presentation Eric was taken out to lunch by his favourite staff members Jack and Roger for a pie and a pint which he loved.